Turnip the volume for the vegetable orchestra! Take a look at these musicians who've bid farewell to their flutes and violins in favour of carrots and courgettes. The Vienna Vegetable Orchestra (or, Das erste Wiener Gemüseorchester) is the first orchestra of its kind, founded in 1998. Since then, a number of vegetable orchestras have sprouted throughout the world for impromptu concerts and events. 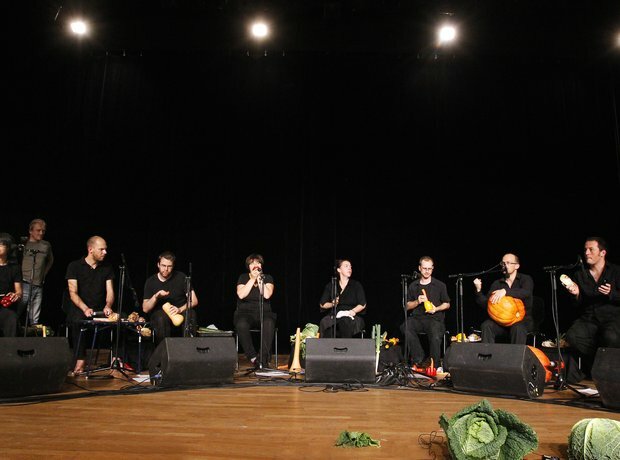 Performing on carrots, parsnips, cabbages, celery, peppers, and more, these performers specialise in creating unique instruments from fresh veg. Just like more traditional woodwind instruments, the larger the vegetable, the lower the sound. Leeks, carrots, courgettes and peppers - just some of the vegetables being transformed into instruments. Just like a traditional orchestra, there are three main instrumental families: percussion, woodwind, and brass. As well as being edible, vegetable instruments are more versatile than their traditional orchestral cousins. Carrots can be carved into woodwind instruments, or drilled and hit with a stick to create different percussion of different pitches. A concert or studio performance like this uses about 40kg of veg. And as vegetables don't stay fresh for long, the players have to re-fashion their instruments ahead of every performance. It's not often we'd advise instrumentalists to drill into their pride and joy before heading out on stage. But these performers do just that - this courgettist is hollowing out the vegetable so it becomes a wind instrument. The Vienna Vegetable Orchestra even use the drills and tools on stage to add to the range of sounds they can make. It's not just woodwind instruments in a vegetable orchestra: this leek is being used as a violin, complete with a leek bow. Hollowing out carrots and blowing through courgettes is just one way of making music in a vegetable orchestra - rustling leaves or crunching up herbs also creates interesting musical textures used by the performers. It might look easy to play, but creating a pumpkin drum is a labour of love. Exactly the right amount of flesh needs to be carved out to ensure the instrument plays at the right pitch - and if it's carved too thinly, it'll just collapse when hit. As well as being instruments in their own right, carrots provide a useful mouthpiece for larger instruments. Played like a trumpet, covering the holes in this hollow courgette will change the pitch, while the bell pepper on the end amplifies the sound - just like a real trumpet. Once the vegetables have been peeled, carved, hollowed and cut, they only last around 24 hours - long enough for one concert, or one session in the studio. Luckily, they're a lot easier to recycle than more conventional orchestral instruments. After transforming a simple carrot into a fully functional woodwind mouthpiece, it can be used to play variety of different vegetables. Joining two carrots together creates an instrument similar to a recorder. After a bit of careful drilling and scooping, this pepper has been transformed into a trumpet-like instrument, with a mouthpiece and even a mute. Not a sight you'd see before an LSO concert: the orchestra are hard at work, drilling into their instruments. Even the slightest difference in the width of the holes has an impact on the pitch and tone of the vegetable. An unusual instrumental hybrid, this courgette-pepper-carrot is played like a recorder with a trumpet mouthpiece. And surprisingly, it sounds a bit like a clarinet. It might look like both these performers are playing the same instrument, but these two carrots have actually been carved quite differently. One is played by blowing a raspberry into the mouthpiece, much like a brass instrument, and the other is played like a recorder. While some instruments need a carrot mouthpiece, others can be played by blowing a raspberry into the hollowed-out tube. The bell pepper on the end amplifies the sound. Just like a trumpet, this performer is covering the end of the instrument to change the sound. It's a technique known as 'hand-stopping', creating a wah-wah effect. While traditional orchestras take great care of their instruments after a concert, it's a lot easier for a vegetable orchestra to down tools and head to the bar. The veg sounds best when it's fresh, so there's little point in keeping it; may we suggest a couple of healthy stew recipes?